I Only Have Eyes for You is the usual sort of jazz song performance, with a muted trumpet solo, then a return to the song which is improvised vocally. Fair enough I thought, but the tracks get more interesting as you continue listening. Lovers In A Dangerous Game shows tension produced by brushed drums; I Can’t See For Lookin’ has amusing lyrics ‘maybe I talk too much, maybe I’ve lost my touch’; the Arlen/Koehler spiritual influenced Get Happy is sung in a more bluesy voice, with all the musicians joining in; Far From The Home I Love is a wistful, melancholy song about a woman who is homesick yet wants to stay with her man; Dedicated To You has the voice brought close to the microphone, intimate and smooth jazz. 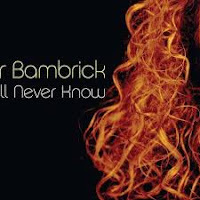 The Bambrick original, I Don’t Mind A Bit, is an amusing song similar to My Funny Valentine, with lines such as ‘and socially you’re quite a twit’, and our singer whistles a half chorus, adding to the fun. Kurt Weill’s My Ship, a beautiful song about a luxurious ship which is bringing a lover back, includes a fine and appropriate guitar solo. Other tracks are: Never Never Land; How Does It Feel; You’ll Never Know; Surrey With The Fringe On Top; A Time For Love. I was a bit puzzled about why the final track was included. This was the Newfoundland folk song Petty Harbour Bait Skiff, concerning a fishing boat disaster, a jazzy version, well sung with just a piano accompaniment. This was a sad song to end with and although the performance was good, the song seemed as if it belonged to a different CD, perhaps a CD wholly of jazz interpretations of folk songs. Nevertheless, it didn’t detract from the enjoyment of the CD as a whole.